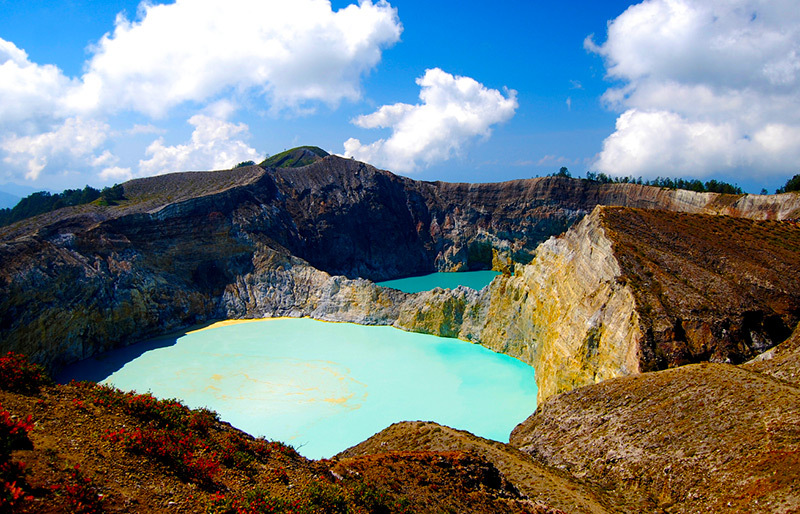 Kelimutu Lake is a crater lake in the peak of Kelimutu volcano mountain, and it becomes part of Kelimutu National Park. The mountain is located in Pemo village, Kelimutu Sub-district, Ende regency, Flores Island. By the magnificent color that it has, this lake is also popular with Three Colors Lake. The colors are red, blue and white. Those colors are not settled and it can change in times. Kelimutu Lake is having 1.631 M above sea level and the name is following the name of the Mountain, Kelimutu. The word Kelimutu is taking from Keli that means mountain, and Mutu means boiling. Those three lakes are having 1.051 million square wide, with water volume of 1.292 million cubic meters. Urban legend says that on each color in the lake is having different power; The blue lake or Tiwu Nuwa Muri Koo Fai, is the place of young people soul who have died; The red lake or Tiwu Ata Polo, is a gathering place for the dead who had done evil or doing witchcraft during their previous life; The white lake or Tiwu Ata Mbupu is a gathering place for the elder soul who have died. The access to this area is from Kupang, by using the plane to the city of Ende, Flores island, for about up to 40 minutes; then it continued by using public transportation such as mini bus, to Kaonara village, within 93 km, with a travel time about 3 hours. From Koanara to the summit of Kelimutu Lake, it takes 2.5 km.